I started my second simultaneous campaign yesterday with Greg. Greg is an Early War fan so we were both keen to start a campaign using the 1940 Blitzkrieg CoC rules and army lists. 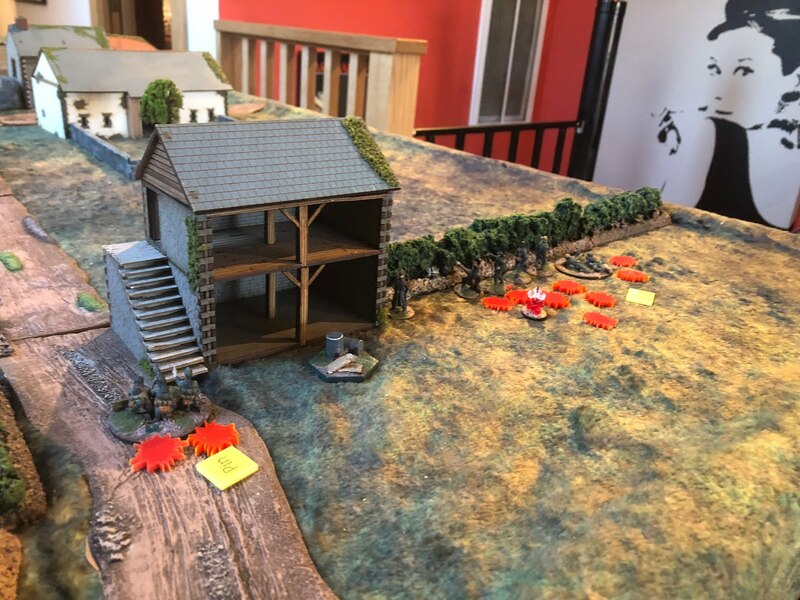 This mini-campaign appeared in the recent Lard Magazine and it looks like a lot of fun. 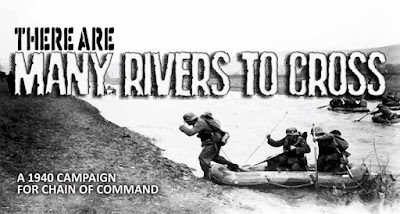 The campaign is generic in that it can be played with any force from the Blitzkrieg book as well as anywhere in France, Holland or Belgium. Since I have Belgic forces, we set it in Belgium in May of 1940. 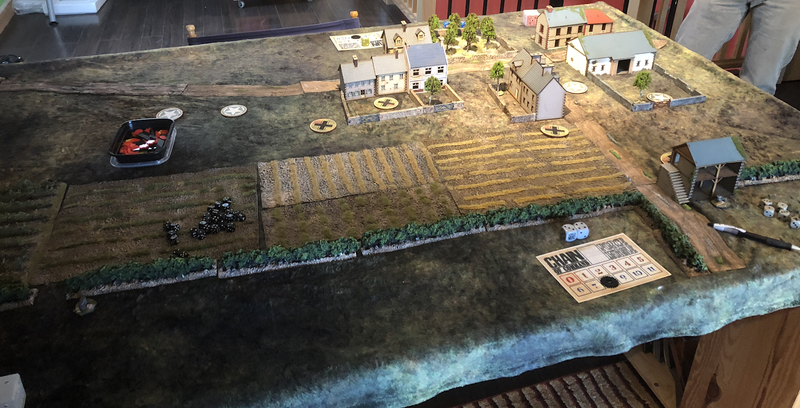 Interestingly the campaign starts on Table 2, as the Germans (attackers) have already crossed the first river and are approaching a town. 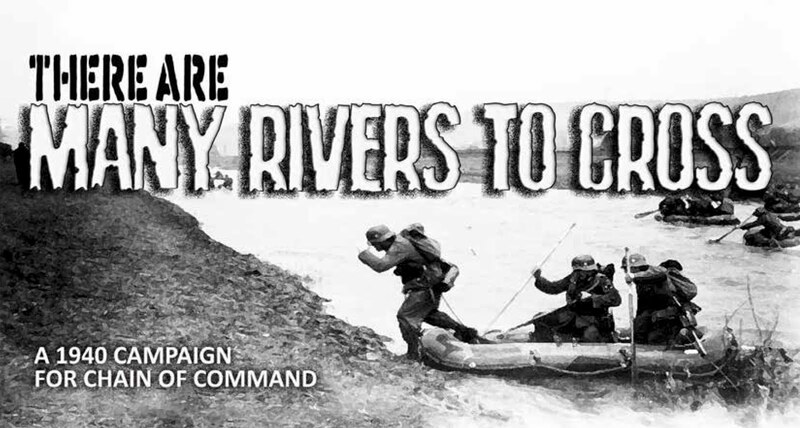 They have yet to build bridges so they are limited to infantry forces only and can not use ATG's, IG's or any vehicles in the first 2 campaign turns. 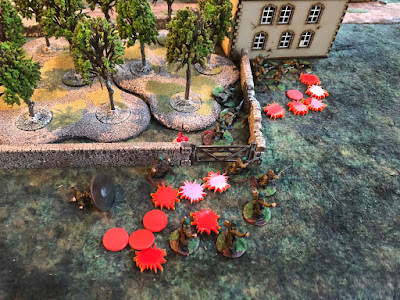 If the German fail to take the 2nd table, the Allied forces can attack back on to table 1 and if victorious in turn 2 and seize Table 1, they would have a complete victory in a very short campaign! The German force do have a significant advantage in support in the first turn with 2d6+6 while the defender has 1d6+2. In the background of the campaign, German pioneers are building a bridge and the Allies are sending engineers to destroy it. We got together yesterday and drew sides by chance. I ended up playing the Germans. I am by nature a player who prefers defending rather than attacking but this sort of worked out as I have noted after 3 games with Greg that is a fairly aggressive attacker. We were both going to be challenged! The table as set up, you can see the patrol markers. I only blew one building with the Stuka Bombardment. It was a UXB, but fortunately was in house in the mid foreground which was not going to be invloved in my plan of attack. 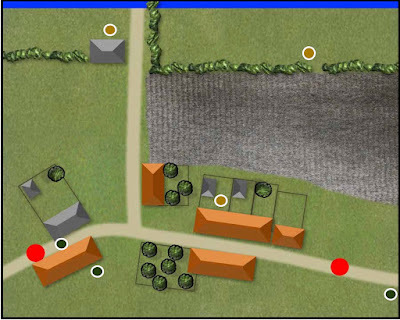 The light brown circles are the German JOP's and as you can see I was able to get a JOP in an advanced position. I had to be cautious though as Greg is very adroit at capturing them as I have found out in the past. To win, I had to clear 2 of the 3 far sections of the table while getting a unit off the far side or of course force the Belgians off the table by withdrawal or morale failure. 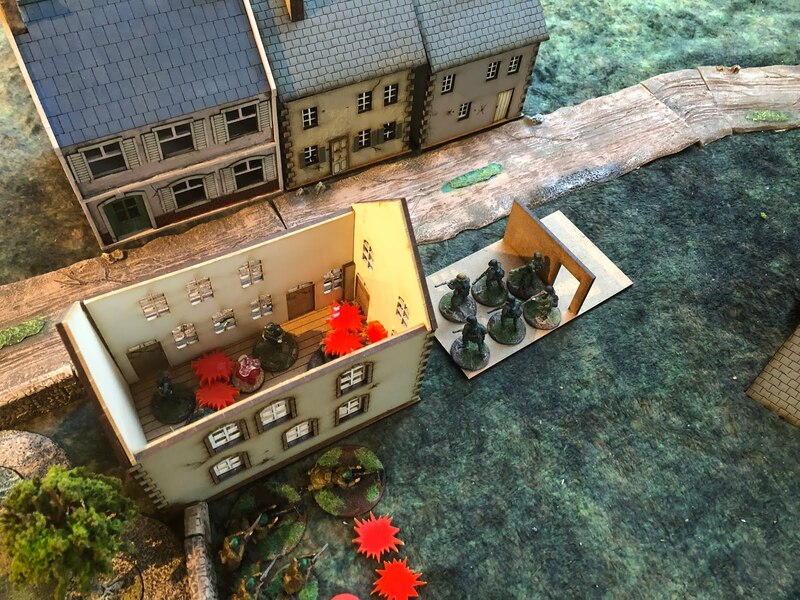 Greg had almost immediately placed a MMG team in the bunker defending the T-junction on my right flank. Fortunately I had chosen a Bunker Buster 8.8 cm gun as an off-table support. We did allow the bunker to be graded as a fortification which made it quite difficult to crack even with the 88. The Stuka bombardment was relatively effective in keeping the Belgians from deploying and when they did, they did suffer not insignificant shock. Greg did throw a 3d6 on his CD early on so it really only affected 2 of his 4 units. 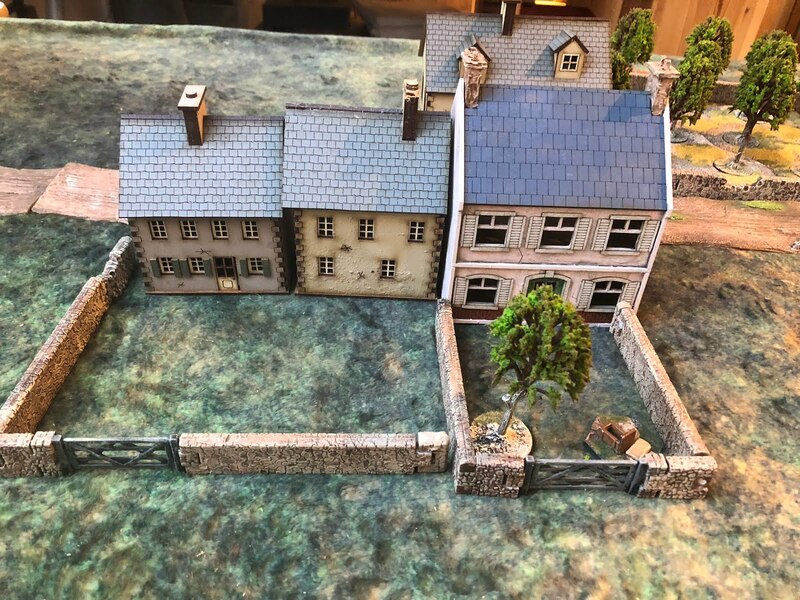 I was quite concerned about Greg capturing my forward JOP so after I placed a squad behind the hedge to cover my left flank, I dropped a squad in the fenced garden of the house in the photo below and quickly added a Flame Thrower Tm as well as a SL. 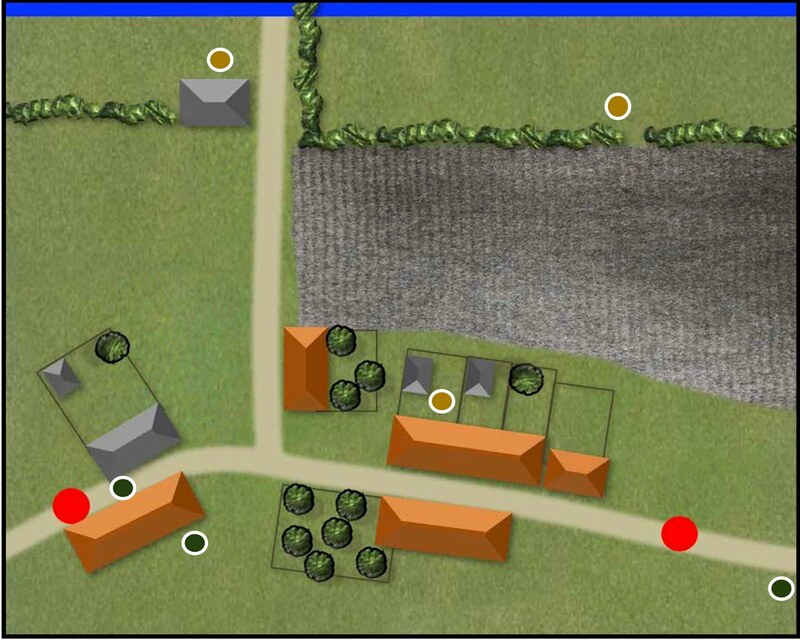 By then Greg had a Group de Combat in the orchard in his centre. I followed with my 3rd squad on my right flank while Greg placed his DBT section behind a house on his left flank and placed his 2nd Group de Combat in the large barn on his left flank. 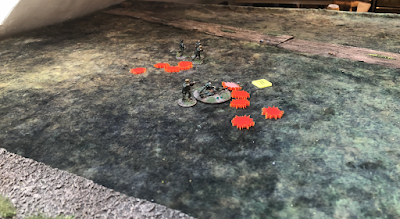 Fire ensued between the 2 sections confronting each other on the German right flank, the Belgians are numerically superior and were in hard cover but I was able to keep things going by placing a SL with the Schutzen squad to remove shock. 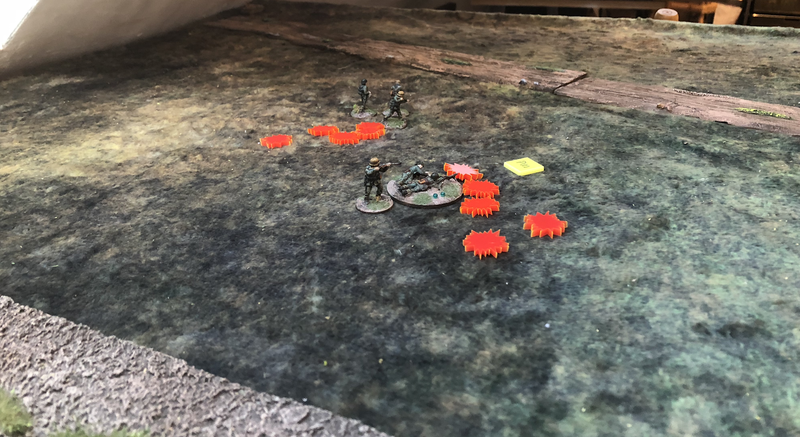 A battle between pretty equal forces, one being in hard cover and the other being in light cover was not going to go well for the Germans in the long run so it was time to make my move. I was worried though that Greg by now had 2 CoC dice and I had none. It is hard to advance aggressively even on a double phase if your opponent can interupt. 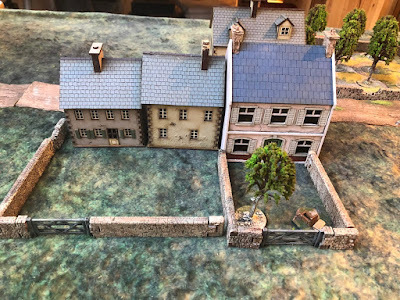 I moved my forward squad with the SL and the FT Tm into the house below on the left with a plan to exit onto the road. Greg moved his GdC behind the house on his side of the road. At the same time, I advanced my squad on the left to take his un-protected JOP on his far right flank. This was a mistake as his GdC in the centre could fire at them. By then both our FM's were down to 5, but I had slight advantage although I now had 2 squads pinned, I had killed one of his JL's and his single SL was down for the turn. My 2 SL's were still good and industriously removing shock. I moved my forward squad out of the house, crossed the street and was rapidly able to get them in the house overlooking the orchard. 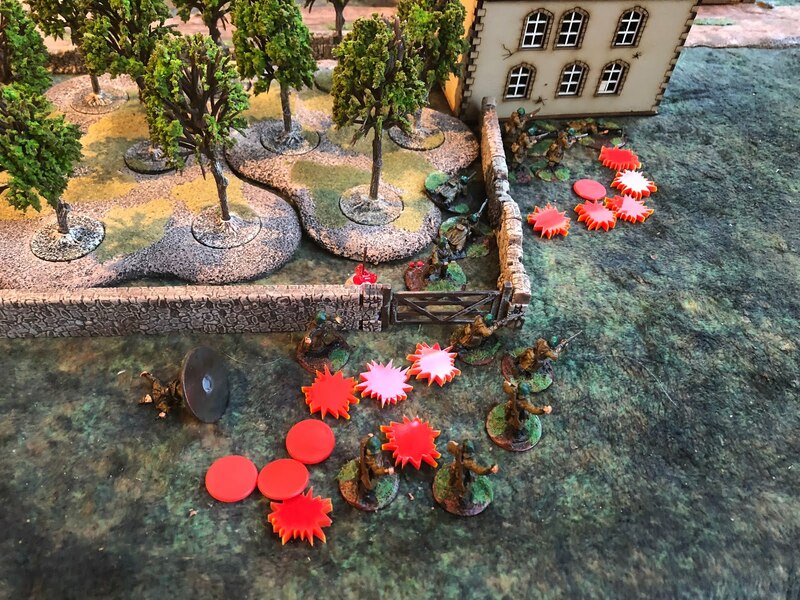 I felt I was finally in a good position to force Greg to withdraw but he fought on hurling grenades in through the windows, he caused shock but no kills and the Germans were then able to rain fire (literally and figuratively) on the Belgian troops. Greg dropped to a FM of 3 but used his CoC dice to prevent taking a FM test when his SL went down. He dicided to play one more turn but really his ability to counterattack was done and on my next turn I forced his FM to zero. Game over and a German victory. .....but also tricky to be in an enclosed space with greandes going off! Well it is shaping up to be an interesting campaign, I was happy to win as an attacker. We will have to see how it goes. I can recommend buying the Lard Magazine for this campaign alone. I see some Empires at War and 4Ground buildings in the photos (what most of my collection is, too), but what is the building by the Forward German JOP? Is that Crescent Root? They are really the best 20mm mdf out there.